Well made and true to size. Comfy, warm and great attention to detail both in the design and manufacture. There's no Armortech in the back, but that's arguably an area that doesn't need it and the added stretch aids comfort. if I had to pick, I'd say the outside pockets could be a little deeper, but otherwise this is a great jacket. The chest protector makes it even warmer. Several hours in 0-3 degrees and no problem with the just the Rukka Outlast vest on underneath. Yet to see how well the venting works in the summer. After trying for max discount on this jacket they came good in the new year, cheapest by far. Told it would be late when I enquired about it and turned up a day early. Win Win Jacket is a bit different to get into as it only has a single zip but latest technology hopefully keeps it watertight. 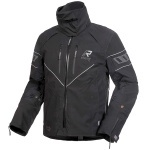 Love the Rukka kit, this replaces my 4 year old jacket that still looks like the day I bought it and still waterproof. At last something that will last. Having previously purchased a premium RICHA C Change Bike suit and been let down by poor performance and dreadful customer support by the manufacturer I took the plunge and purchased a Rukka bike suit. First impressions are brilliant. No more soggy bottoms, warm and very comfy. The zips and fasteners feel very durable. Weight wise this is no heavier than my old suit but the quality looks and feels like it is on another level. I use this suit every day and having something that is safe, will deliver what's its designed to do and be durable is vital to me. As the saying goes "Buy once, buy right" This is so right. I have always steered myself away from Rukka clothing, mainly because of price but also the lack of effective ventilation in the jackets. Well,50% of my two points has been fixed, the ventilation on this Rukka is a revelation, it works superbly well so is the build quality, it's simply outstanding. As to the other 50% i,e, the price. There is no getting away from it,it is cripplingly expensive. That said,it is the best jacket on the market today, it's brilliant.So re-mortgage the house,sell the wife and kids into slavery and go buy one, you won't regret it. Had it's first outing in the rain last weekend,(Storm Calum). Pleased to report, I was absolutely bone dry and warm all weekend. Happy Bunny! As usual,excellent service from SBS, thank you. Highly protective, chest protector is a hug bonus. Vents work well, with short gloves you do get air through the sleeves as well which helps keep you cool. Liner seems really good, and was warm enough at around 3 degrees. Have only had one wet ride, of course it was waterproof but the water also doesn't soak into the top layer so it dries quick as well. 5 year guarantee is a bonus for sure. As ever the service from the Sportsbikeshop was outstanding. The jacket is everything that I was looking for and I cannot believe how light it's is to wear. Due to the weather we are experiencing I haven't had the chance to try it in the wet but I have never had any issues with Goretex before, so do not foresee their being a problem in this case. I would describe this product as comfortable, well fitting and not bulky. It is warm and waterproof. I went out in the rain and wind without issue. The neck collar is also very effective at keeping out the wind and rain. The chest protector undoubtably adds to maintaining body heat. Hopefully I will not need to write a review on the effectiveness of the body armour, but it fits well in all the right places. Having tried a number of jackets from the excellent Sportsbikeshop and returned them and looking at various YouTube videos I decided to go for this Rukka jacket and matching trousers. OK they are very expensive but you get what you pay for. I took them out today for a 50 mile trip round the Peak District in temperatures just above freezing and I was so comfortable and warm as toast with my outlast base layer on. The D30 armour for the chest gives you even more protection than most other jackets and is not uncomfortable or intrusive. I could easily have spent all day on the bike but chores got in the way. I haven't tried it in the rain yet but I feel sure it will perform as expected. With 6 years warranty I wouldn't hesitate in recommending the Rukka Nivala jacket, and trousers, to anybody who wants to get the best kit on the market. Thanks to Sportsbikeshop for putting up with me sending so many jackets and trousers back to them. Expensive, but the quality is unbeatable. Warm, waterproof and very comfortable - should last years and does exactly what it says! If you ride in the winter this is what you need. Wish I had forked out for the best years ago! Winter approaching and I needed a new coat, did lots of research and went on lots of forums and ended up opting for the Rukka, I wasn't disappointed and wish I'd bought one of these years ago, would have saved myself a lot of money! Extremely well made as you would expect, tough and durable, I'm a large size 44 inch chest but I ordered the XL and it fits perfectly, the D30 armour is great, shoulders and elbows is massive compared to any other armoured jackets I've had, I took the back protector out though as I prefer to wear a separate back protector, personal preference, there's armorcor in all the right places, I think it could possibly of benefited with maybe some on the chest and some on the back, the D30 armour is also only level 1, that said I don't race therefore level 1 is ample. The jacket is extremely warm, even without the separate down liner and I tested it for the first time in rain the other day, and it really was a torrential downpour, I stayed perfectly dry! The lining jacket doesn't zip into the main coat but that suits me fine, I hate those fiddly zips on some other coats I've had, it does say you can wear the insert as a stand alone coat, and that is true, it is however quite short. My only really picky gripe with this coat is that the sleeves tend to ride up a bit when I'm riding the bike, a Yam S10, that said I love it, great investment, I feel totally protected, warm and dry, would I recommend it .......Hell yes. As always great service from SBS 5 star. This jacket is fits perfectly I ordered my normally size L. With the inner jacket on I can still fit a warm top underneath for winter riding. 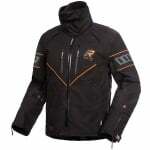 With it removed for warm weather riding the jacket doesn't flap in the wind and keeps you cool. Water just runs off. You get what you pay for, 6years warranty you can't go wrong.